Take part in our Virtual Easter Egg Hunt and be in with a chance of winning a FREE boarding stay! This Easter, we’re giving you the opportunity to win a FREE 2-night boarding stay for your dog or cat, by taking part in our Virtual Easter Egg Hunt! To be in with a chance of winning, simply find all 5 eggs hidden on our website, and send us a private message on our Facebook page telling us where you found them, before Monday 22nd April. We will choose a winner at random from all the correct entries. …but this one doesn’t count! The competition is open to all members of the public (“the entrant”) who are not staff members of Campus Vets and Pets or The College of Animal Welfare. 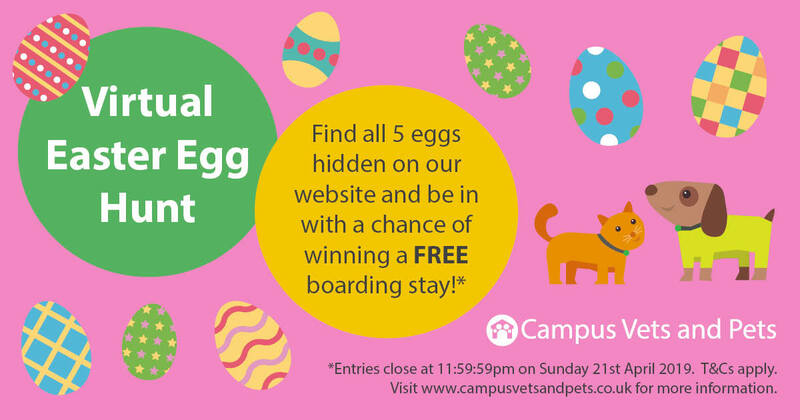 In order for the entrant’s competition entry to be valid, the entrant must send a private message to the Campus Vets and Pets Facebook page, detailing the correct location of each Easter egg on the CVP website before 11:59:59pm on Sunday 21st April 2019. Any entries received publically or via channels not outlined above will be removed and disqualified. The winner of the competition will be chosen at random by Campus Vets and Pets, from all correct entries received. Winning the competition entitles the entrant to a free, two-night boarding stay at the Campus Vets and Pets boarding kennels/cattery for one cat or dog. The two-night boarding stay must be booked consecutively. Campus Vets and Pets will notify the entrant of their successful entry and send them the voucher via post. The entrant agrees that Campus Vets and Pets will not be held liable for the loss of the voucher once posted. Campus Vets and Pets reserves the right to end this competition at any point at their discretion.